There are approximately 47 species of sea snakes (hydrophids) in 2 sub-families. · There are approximately 47 species of sea snakes (hydrophids) in 2 sub-families. They are easily distinguished from eels by their nostrils, whereas eels have gills, fins, and no scales. Sea snakes do not hiss as their land relatives, but produce a low pitched gurgling sound. They are all venomous and have fixed fangs with the venom duct opening near the fang’s tip. · All the Indian seas (Indian Ocean, Bay of Bengal, and Arabian Sea) abound in venomous sea snakes which are characterised by their flattened, paddle shaped tails. The belly scales are generally not as broad as in the land snakes. These snakes are generally bluish, greyish, or greenish in colour, and may have conspicuous bands on the back. They generally grow up to 4 to 5 feet in length, but may occasionally be 9 feet long. There are 29 species of sea snake in Indian waters, and though they are all venomous, they generally do not bite humans. They feed entirely on fish, and favour coastlines, sometimes resting in puddles of sea water between rocks. Apart from the paddle shaped tail, these snakes can be distinguished by the nostrils which (unlike in land snakes) are situated on the top of the snout. This enables them to breathe while in water. · The venom of sea snakes is predominantly myotoxic. 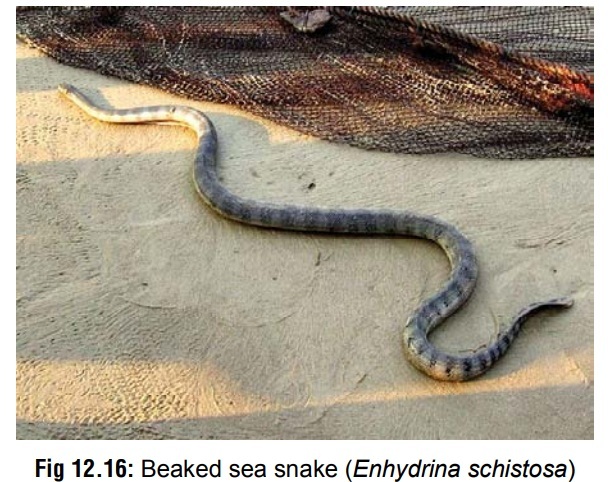 Enhydrina schistosa (beaked sea snake) is encountered in theArabian Sea, Bay of Bengal, Andaman Sea, and W. Indian Ocean. Adults are dull olive green or pale green, or grey with dark bands (Fig 12.16). The belly is cream to dirty white in colour. Head is greenish without markings, while the tail is mottled with black. Average length of these snakes is 3 to 4 feet. The shield of the lower jaw is small and buried in a cleft between the first pair of labials giving it a beaked profile, and hence the common name. · Hydrophis bituberculatus is seen in the Bay of Bengal, andcoasts of Sri Lanka, while Hydrophis caerulescens is seen in the Arabian Sea, Bay of Bengal, and Andaman Sea. Hydrophiscyanocinctus is encountered in the Persian Gulf, Arabian Sea,Andaman Sea, and possibly also the Bay of Bengal. It is called annulated sea snake, and is whitish, pale green, or yellow in colour with blackish crossbands that may or may not encircle the body. Hydrophis fasciatus is seen in the Bay of Bengal, Andaman Sea, and possibly also the Arabian Sea. It is called banded small-headed sea snake, and has a small head with a long and slender neck. It is grey to dirty yellow in colour with dark crossbands that are widest on the vertebral surface and taper to points laterally. The neck is dark olive green to black in colour with yellow crossbars or spots. Hydrophis ornatus (reef sea snake) is seen in the Bay of Bengal, Andaman Sea, and the Arabian Sea. It is a large-headed, stout bodied snake, and is greenish-white, olive green, or yellow in colour with wide, dark crossbands or rhomboid spots.